Avenue of poplars at Srinuggur, Kashmir. 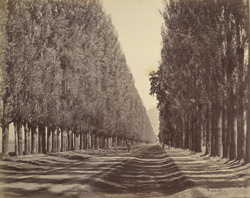 bl.uk > Online Gallery Home	> Online exhibitions	> Asia, Pacific and Africa Collections	> Avenue of poplars at Srinuggur, Kashmir. Photograph of in Srinagar, Kashmir, taken by Samuel Bourne in the 1860s. Bourne describing the picturesque scenery of the 'Vale of Kashmir' says, "Avenues and rows of tall massive poplars greet the eye in many directions, clumps of heavy-foiled chunars overshadow knots of dirty but picturesque cottages, feathery willows bend over water-courses and, as a noble background to the whole, ranges of snow-and cloud-capped mountains shut in the view on every side." This is a view of an avenue of Poplars. Poplars are fast growing trees which are often planted along roadsides or river and canal banks to act as wind barriers.